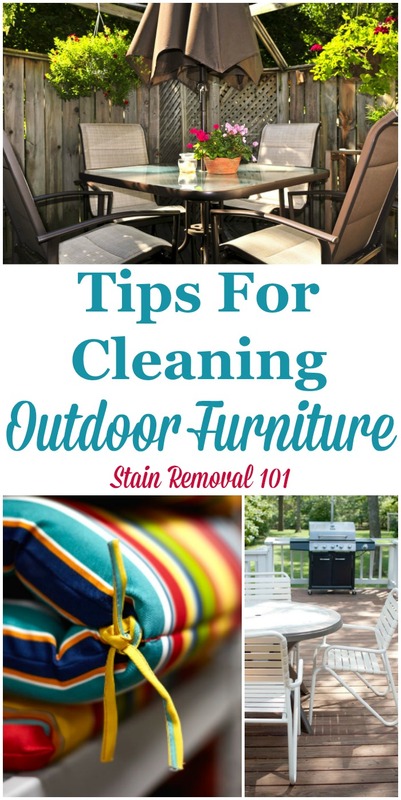 Here are tips for cleaning outdoor furniture, such as on your patio, lawn or in the garden, including tips for cleaning outdoor cushions. Warm weather means it's time to go outside and enjoy the sunshine and the great outdoors. You don't have to go on a far-away vacation though to do this, but instead you can head out to your backyard, deck or patio. Often we put out outdoor or patio furniture in these spots so we can relax and recharge for a while, and enjoy time and perhaps even a meal with friends and family outside. Garden, lawn or outdoor furniture, because it stays outside regularly, can get especially grimy and dirty though. 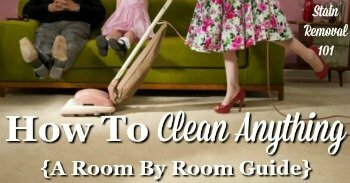 Here are instructions for how to clean this furniture so you can get that job done, and go back to enjoying your rest and relaxation time. It's best to clean outdoor furniture regularly, to make sure you can enjoy it while the weather's nice, and so dirt and grime don't accumulate and become harder to remove. 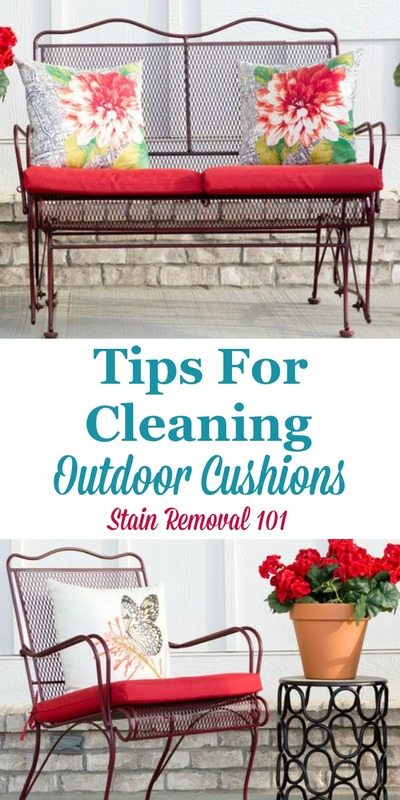 I suggest cleaning these outdoor items about twice a year, at the beginning and end of the season (see my suggestions for the outdoor cushions below, since their care is a bit different). That means cleaning the furniture when you're getting your home ready for warmer weather and again when you're preparing your home for cooler weather. Patio furniture is designed to be tough, and to withstand the elements, which means you can generally scrub it. When you're ready to clean get yourself a bucket of warm water, squirt a few squirts of dish soap into the bucket, and you've got your cleaning solution. Next, get the garden hose and sprayer ready, and get out a nylon scrubbing brush and you've got most of your cleaning equipment ready too. Spray the furniture with the water hose, to get it wet, and then use the cleaning solution and the nylon brush to scrub away the dirt and grime. Don't use anything too abrasive to scrub with, like steel wool, including on plastic, metal or glass surfaces, or it may scratch. If needed, use an old toothbrush to clean in between crevices and grooves within the furniture. Then, rinse the furniture with a garden hose and towel the furniture pieces dry, or let them dry in the sun. 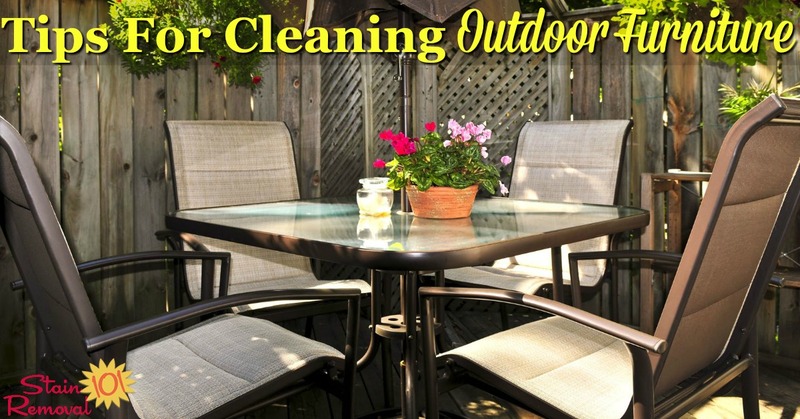 Should You Use Outdoor Or Patio Furniture Cleaner? Above I suggested a simple DIY patio furniture cleaner recipe, of dish soap and water. Often that's really all you need. 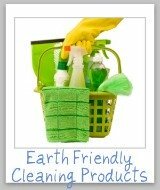 However, you can use cleaning products formulated specifically for outdoor furniture. Some of these products work best on certain types of surfaces, such as plastic, metal or outdoor fabrics, and not others, so always see what it is designed to clean. 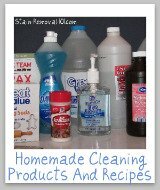 In addition, if your furniture has stains, or is mildewy from being outdoors, some of these products may be a bit stronger, and therefore more able to clean up some tougher to clean messes than the homemade cleaning solution I recommended. Even though your patio furniture is designed to withstand the elements over time the harsh outdoors can have some effect. The wax acts to protect the hard surfaces of the patio furniture from the elements in the same way it works to protect your car's exterior. This works best if done to clean furniture, because otherwise the wax will trap the dirt underneath. While you can generally clean your patio furniture twice a year, cushions are much harder to clean, once they get dirty. It is hard to talk in generalizations about how to clean these cushions, since the type of fabric, coating on the fabric (some have a UV protectant added to them for example), and colors and dyes used in the fabric, will all have an effect on how it should be cleaned. It is best, before you purchase the cushions, to read the care instructions for them and then follow those instructions. Generally though, for light dirt on water resistant cushions, you can clean them with the dish soap cleaning solution and nylon brush I suggested for the furniture itself. Make sure to let them dry completely in the sun, including on the inside, after cleaning them and before storing them. The best cleaning tip for patio furniture cushions is to prevent them from getting excessively dirty in the first place. Make sure you've got a clean dry storage area for your cushions, such as inside the garage or perhaps in a patio storage box, and then store the cushions there until you'll use them. Pull them out for use, and then put them away when your guests have left, or you've finished your refreshing drink sitting on the patio. It is better to keep your cushions dry than to get them dirty and then have to clean them. The reason keeping your cushions dry is very important is to combat the problem of mildew. Once a cushion gets mildewed it is quite difficult to remove the odor, and the mildew spots, because the mildew doesn't just stay on the outside of the cushion, but imbeds itself deeply inside the cushion where it is difficult to remove. You can try to head off mildew, if your cushions get damp, by placing them directly into the sun to dry. Never put the cushions into the storage area you've designated for them while they're still damp, even a little, on the inside. If you didn't catch the dampness in the cushions before it's turned into a mildewy mess though you can try to clean the cushions using a disinfecting solution, with chlorine bleach. The problem with this is that the bleach will often fade the cushions, especially brightly colored ones. You can also check out various mildew cleaners and removers, that can be used on outdoor fabrics, if you're concerned about using bleach. Many of them may fade or discolor the cushion as well though, but it may be worth a try as a last resort, if the cushion will otherwise be stained with mildew, or have a mildew odor. I've personally found it is actually better at that point to just chuck the cushions and get new ones, because no one likes to sit on a mildew smelling cushion. 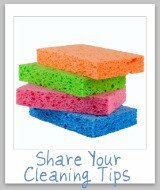 Get more tips for how to clean just about anything here, in the site's room to room guide.